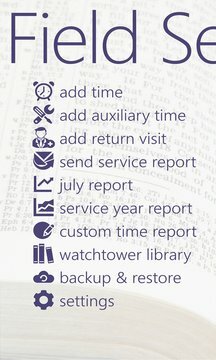 Field Ministry Management Tool for Jehovah's Witnesses. 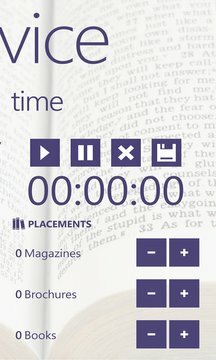 - Keeps time in 15 minute increments (km 10/02 p. 8 par. 6). > User can set a custom increment between 1 to 60 minutes. * Backup & Restore your data to OneDrive. Please report issues to help@square-hiptobe.com or at http://code.google.com/p/my-time-wp7/issues/list Thanks!